Ripple price is currently correcting higher, but it is facing a significant hurdle near $0.4900 against the US dollar. There is a crucial bearish trend line forming with resistance around the $0.4900 on the hourly chart of the XRP/USD pair (data source from Kraken). The pair has to move above the trend line resistance and $0.5000 to continue moving higher. Ripple price struggle to recover higher continues against the US Dollar and Bitcoin. 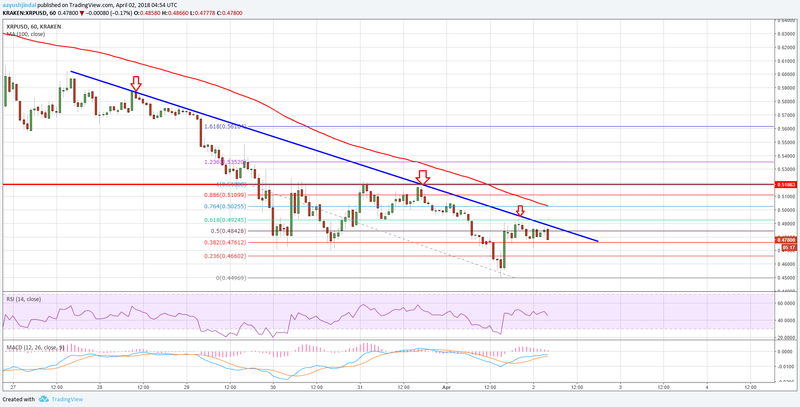 XRP/USD may decline once again if it fails to move past the $0.5000 resistance. There were further declines in Ripple price from well above the $0.6000 level against the US Dollar. The price declined and broke the $0.5500 and $0.5000 support levels. The downside move was strong and the price traded as low as $0.4496 recently. Later, it found bids and started an upside move above the $0.4500 level. It traded above the 23.6% Fib retracement level of the last decline from the $0.5188 high to $0.4496 low. However, the upside move was protected by a major barrier near the $0.4850-0.4900 zone. There is also a crucial bearish trend line forming with resistance around the $0.4900 on the hourly chart of the XRP/USD pair. Moreover, the 61.8% Fib retracement level of the last decline from the $0.5188 high to $0.4496 low also acted as a barrier for more gains. It seems like the price is struggling to move above the $0.4900 level. Further above, the $0.5000 resistance is the next barrier for buyers. A push above the $0.5000 level may open the doors for an upside move. However, if the price fails to move above the $0.5000 level, it could decline back towards the $0.4500 level. 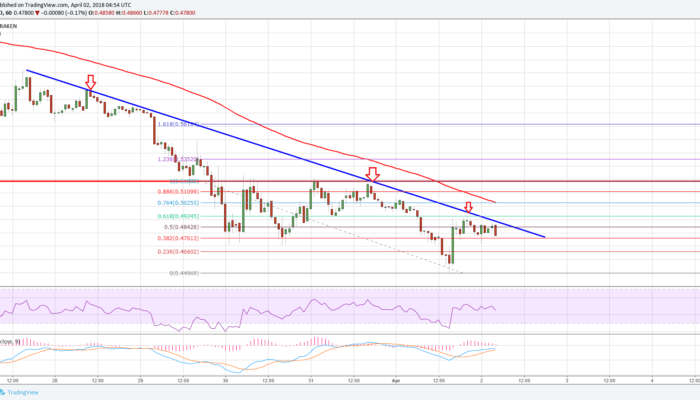 Hourly MACD – The MACD for XRP/USD is again moving back in the bearish zone. Hourly RSI (Relative Strength Index) – The RSI for XRP/USD is moving lower towards the 40 level.